Today's fun adventure was a trip to the vet with Ulysse. He's been behaving in a very strange way since we came back from our mobile home mini holiday a couple of week's ago. I first noticed something was not quite right when I discovered, to my horror, that he'd piddled all over my duvet during our absence. Mini piddles, not gallons' worth but very unpleasant all the same. I had to take the duvet for an industrial wash at the dry-cleaner's in the vague hope I wouldn't have to chuck it and buy a new one. Luckily they do a good job and the duvet needed it anyway. By this time Ulysse was banned from the bedrooms. Not that he's bothered. With the warmer nights he likes to sleep out anyway. During the day, sprawled on my sunbed reading my book, I observed him going all over the place doing mini piddles. Eventually I decided that enough was enough and he should see the vet. Our vet is just down the road and the group has known him since I got him from the SPA back in autumn 2005 just after we moved into this house (THAT long? I've been throwing money into my house-owner's pocket for THAT long? I daren't THINK how much that represents!!). I've had some pretty dodgy experiences with vets in the past, but I'm happy with this set. My worst vet story goes back to the early 90s. My boyfriend and I had 2 Burmese cats, mother and daughter. We got them from a rescue centre because the previous owners hadn't wanted to keep them as they were 'dirty'. All was well for 6 months, then they started piddling everywhere, that nasty greasy smelly piddle. I took them to see the vet. He prescribed one 'cure' after another, none of which had the slightest effect. This went on for a good 12 months and I spent, as you can imagine, a freakin' fortune. Eventually my mother gave me a book called 'Do Cats Need Shrinks?' 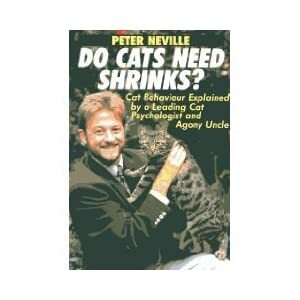 by Peter Neville and in it was the answer to my problem: the cats didn't want to be together. All I had to do was separate them and all would be well. So I put up a small ad in the local English bookshop with a picture of the cuter younger cat. Thankfully, the (British) parents of the shop owner offered to take her. They were retired diplomats and he was confined to a wheelchair which suited my little cat perfectly being very much a lap cat. The cat at home calmed down immediately so the next time I went to the vet for a vaccination, I told him, and he said, 'Yes of course'. The bugger had known all along what I had to do but had chosen to sell me quack remedy after quack remedy to fleece me as much as possible. I was so disgusted I never went back, and it was, in fact, years before I set foot inside a vet's again. My cat didn't seem to need to be vaccinated and was never ill. Anyway, Ulysse is fine, he has crystals in his pee so has been given some special food to eat which will dilute the crystals. I also have to give him pills... That'll be fun! Crossing my fingers for Ulysses. Vets...I have a cat who was on steroids for years because of "dermatitus" (vet diagnosed). Turned out she was allergic to most cat foods. She's fine now on kitten food. Poor Ulysses, hope he/she gets better soon! Its good to have a good vet (just like having a good Doctor Johnny :) ). I wanted to test our cats for toxoplasmosis recently and instead of taking my money, my vet pointed out that it was pretty much pointless as I would have to have the tests done on a regular basis and if the cats go out they may test negative today but positive tomorrow. He saved me a few bob and I think there would have been plenty of others who would have taken my money more than happily. I found out that piddles everywhere mean my cats are unhappy with me. They don't like to be left alone, whenever we go away and leave them in the house (with someone looking after them of course!) we come back to piddles... It used to be just the odd one which we would often think was our fault as maybe the litter tray was too dirty, but this last time I counted no less than 7 piddles - in my wardrobe, on my table, on my teddy bear, duvet - everywhere! Totally gross and so annoyed I really thought one of them was ill this time. But my vet told me that my cats were angry with me at leaving them on their own!! Expressive creatures they may be, but next time they are going to the cattery! PG - sounds another Dodgy Vet story to add to the list. Johnny - they get instant treatment cos owners pay on the spot. There are no layers of animal NHS management saying what they can and can't have. Piglet - I think Ulysse gets cross too when I leave him. He takes it out on one particular pot plant which seems to be condemned. Little bugger.